Analyst Rating is the summary expression of Morningstar's forward-looking analysis of a fund. Morningstar analysts assign the ratings on a five-tier scale with three positive ratings of Gold, Silver, and Bronze, a Neutral rating, and a Negative rating. The Analyst Rating is based on the analyst's conviction in the fund's ability to outperform its peer group and/or relevant benchmark on a risk-adjusted basis over the long term. If a fund receives a positive rating of Gold, Silver, or Bronze, it means Morningstar analysts think highly of a fund and expect it to outperform over a full market cycle of at least five years. The Analyst Rating is not a market call, and it is not meant to replace investors' due-diligence process. It cannot assess whether a fund is the right fit for a particular portfolio and risk tolerance. Morningstar evaluates funds based on five key pillars - Process, Performance, People, Parent, and Price. Analysts assign a rating of Positive, Neutral, or Negative to each pillar. Analyst Rating Scale - Gold: Best of breed fund that distinguishes itself across the five pillars and has garnered the analysts' highest level of conviction. Silver: Fund with advantages that outweigh the disadvantages across the five pillars and with sufficient level of analyst conviction to warrant a positive rating. Bronze: Fund with notable advantages across several, but perhaps not all of the five pillars. For each fund with at least a three-year history, Morningstar calculates a Morningstar Rating based on a Morningstar Risk-Adjusted Return measure that accounts for variation in a fund's monthly performance (including the effects of sales charges, loads and redemption fees), placing more emphasis on downward variations and rewarding consistent performance. The top 10% of funds in each category receive 5 stars, the next 22.5% receive 4 stars, the next 35% receive 3 stars, the next 22.5% receive 2 stars and the bottom 10% receive 1 star. Each share class is counted as a fraction of one fund within this scale and rated separately, which may cause slight variations in the distribution percentages. The Overall Morningstar Rating for a fund is derived from a weighted average of the performance figures associated with its three-, five- and ten-year (if applicable) Morningstar Rating metrics. 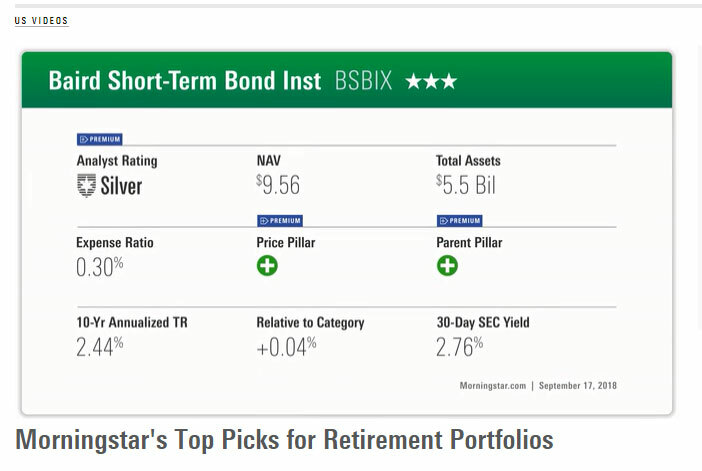 The Morningstar three-star rating for the Institutional Class Baird Short-Term Bond Fund (BSBIX) is the overall rating received among 447 Short-Term Bond Funds, as of June 30, 2018. The fund received three stars for the three year period among 455 Short-term Bond Funds, four stars for the five year period among 393 Short Term Bond funds and three stars for the ten year period among 255 Short term bond funds. The Morningstar four-star rating for the Institutional Class Baird Aggregate Bond Fund (BAGIX) is the overall rating received among 858 Intermediate-Term Bond Funds as of June 30, 2018. The fund received four stars for the three year period among 858 Intermediate term bond funds, four stars for the five year period among 784 intermediate term bond funds and four stars for the ten year period among 561 intermediate term bond funds. BSBIX is in the Short Term Category and BAGIX is in the Intermediate Term Bond category. Performance data represents past performance and does not guarantee future results. The investment return and principal value of the investment will fluctuate so that shares, when redeemed, may be worth more or less than their original cost. Current performance data may be lower or higher than the data quoted. To read the fund’s prospectus or to obtain the fund’s performance to the most recent month end, SEC 30-day yield information, any sales charges, maximum sales charges, loads, fees, total annual operating expense ratio, gross of any fee waivers or expense reimbursements as stated in the fee table contact Baird directly at 866-442-2473 or visit the find’s webpage here for BSBIX, here for BAGIX. Investment minimums for these institutional class funds is $25,000.